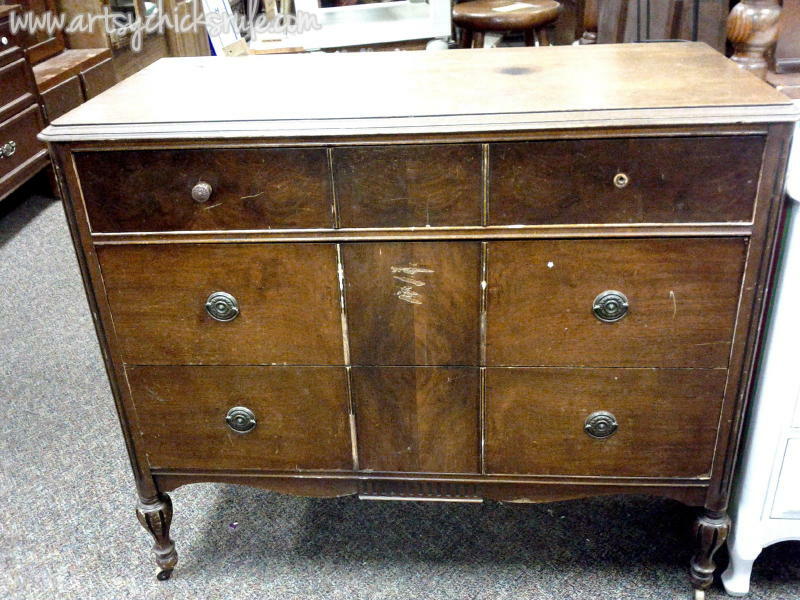 Ever thought of turning a dresser into a coffee server? You can! 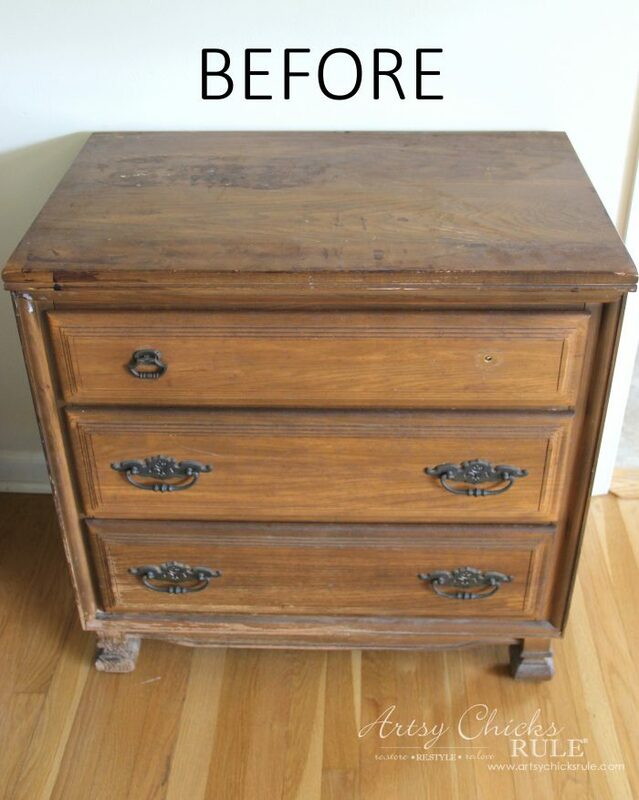 Today I’m sharing out I turned this old antique (beat up!) dresser into a coffee server for my home. 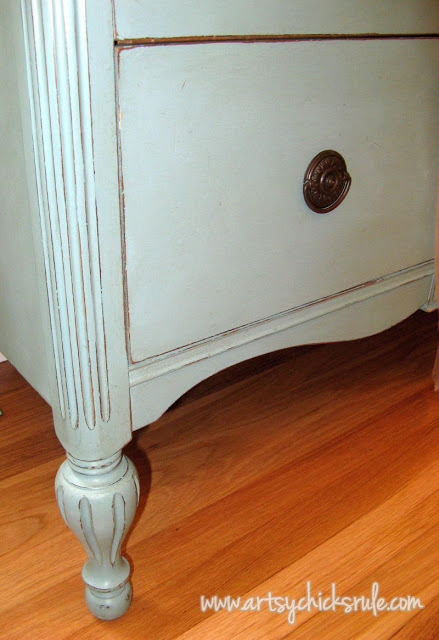 You may have seen this dresser in my Dining Room Reinvented post. 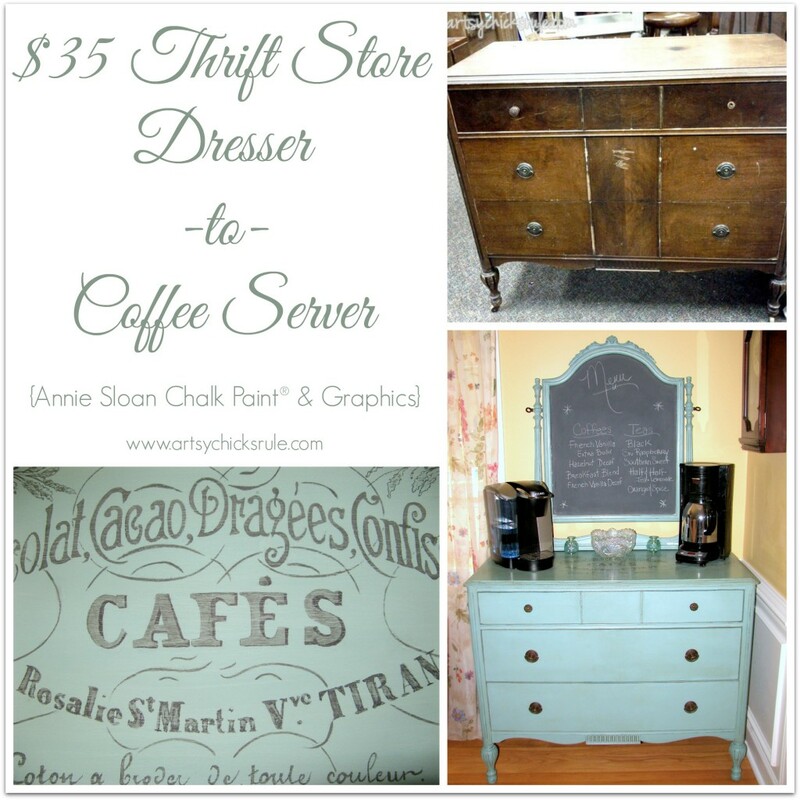 Actually it’s an antique dresser I turned into a Coffee Server Station. And here is how it came to be…. I adore older pieces like this and love when I find them. But this one was in pretty poor shape. A knob was missing and one wheel was missing. Which I would have LOVED to have kept in place but could not find a suitably sized match. I could have replaced all four but that would’ve defeated the whole purpose. Trim pieces were broken and missing from the drawer fronts but I knew it could be beautiful, so home with me it came. The trim on the top drawer was intact, so it stayed. 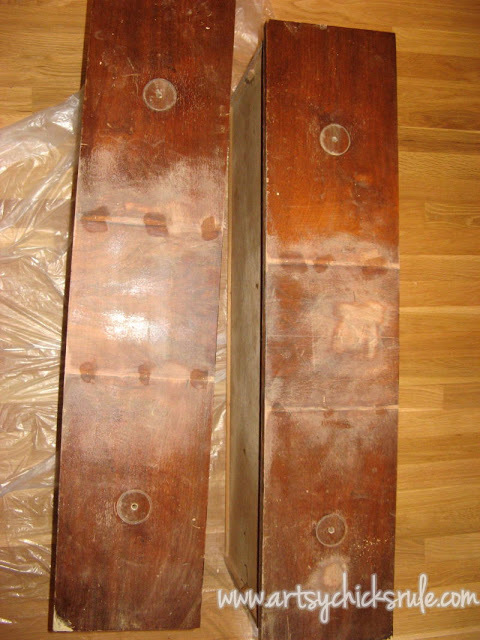 The trim from the bottom 2 drawers was broken with pieces missing. It pained me because I really wanted to keep it. 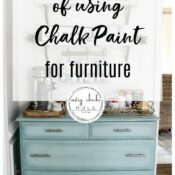 I chose to paint it in (ASCP) Chalk Paint®. 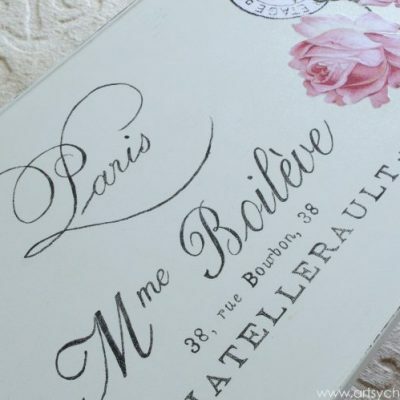 I wanted something similar to Provence (which I was out of) so I mixed several of her other colors and came up with this. 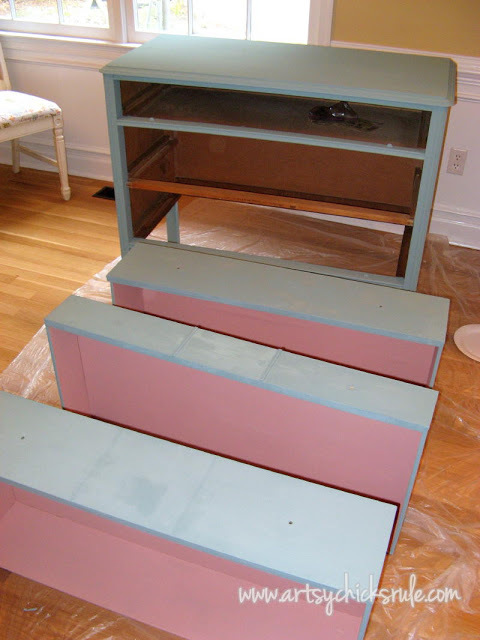 I used Scandinavian Pink for the insides of the drawers. Isn’t that just the greatest color combo?? And since I was going to be using the drawers for coffee mugs, filters and such, I sealed the inside of the drawer paint with polycrylic instead of wax. I really wanted to put some graphics on the top of this piece. And since it was going to be used as a “Coffee Server” I wanted it to say “Chocolate or Cafe” or something along those lines. I couldn’t find exactly what I wanted so I used parts from 3 different graphics and transferred what I wanted from each. I found them here… The Graphics Fairy. She has a bunch of really beautiful graphics. I love to just sit and scroll through them all. 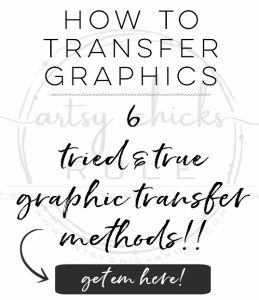 There are several different ways to transfer the graphic to the furniture. 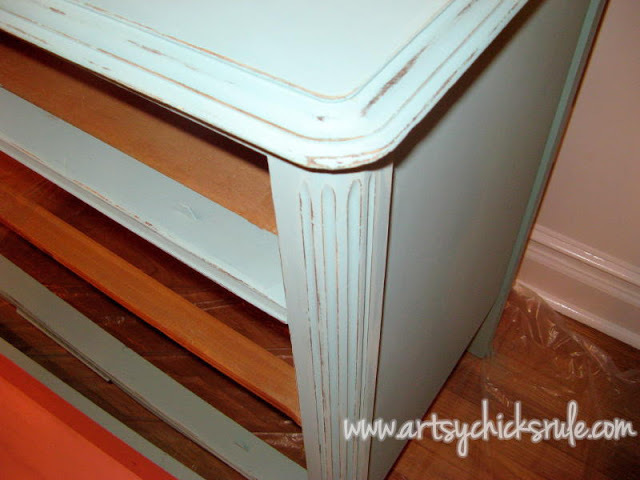 I have used another method (wax paper/printer) on a few smaller pieces of furniture though. I chose to do the projector method below. 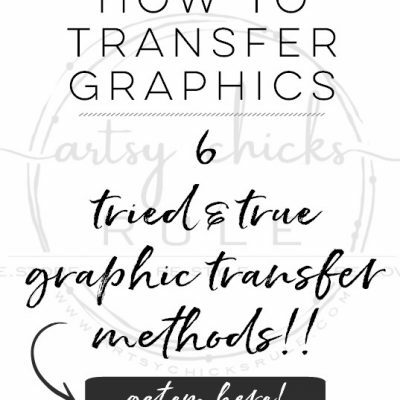 Well, that was after I saved the graphics to a flash drive, drove to OfficeMax and had them make some transparencies for me. 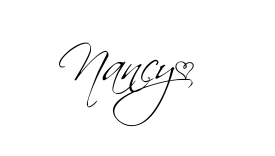 Here it is once I had drawn the graphic from the projector onto the top of the dresser. I used watercolor pencils to transfer the image. 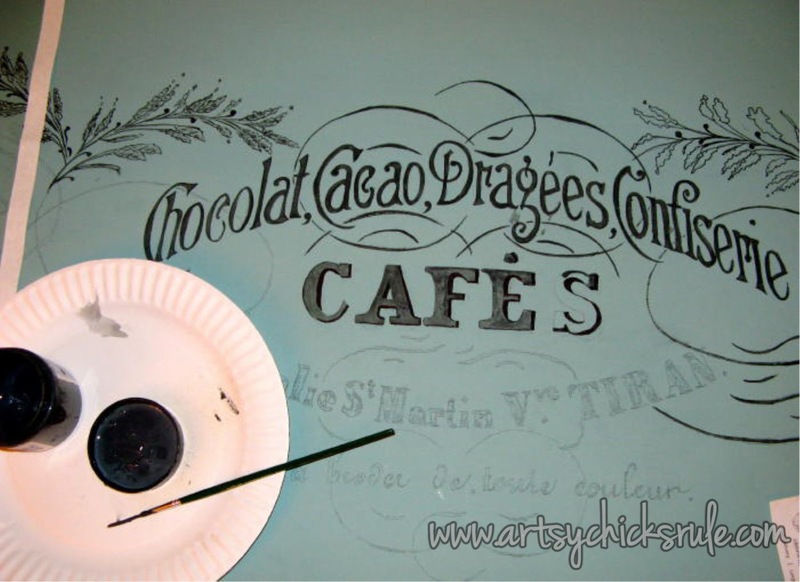 And hand painting in the wording….. I used ASCP in Graphite for the lettering and my favorite type of paint brush for this. After I finished painting I used some fine sandpaper and distressed the lettering just a bit. Mostly clear with just a bit of the dark. A little of that goes a LONG way. I did 3 coats of wax on the top since I was going to be using this as a Coffee Server station. It has held up beautifully, by the way. 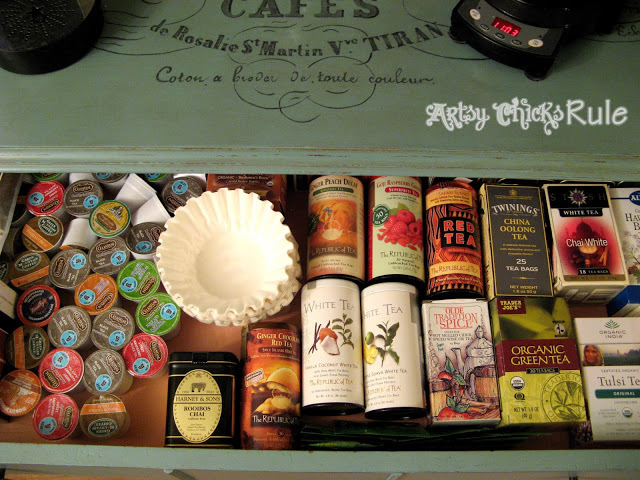 My K-Cups, coffee filters and such are in the top drawer. Mugs are in the second drawer and travel mugs in the third. I just love all the details! 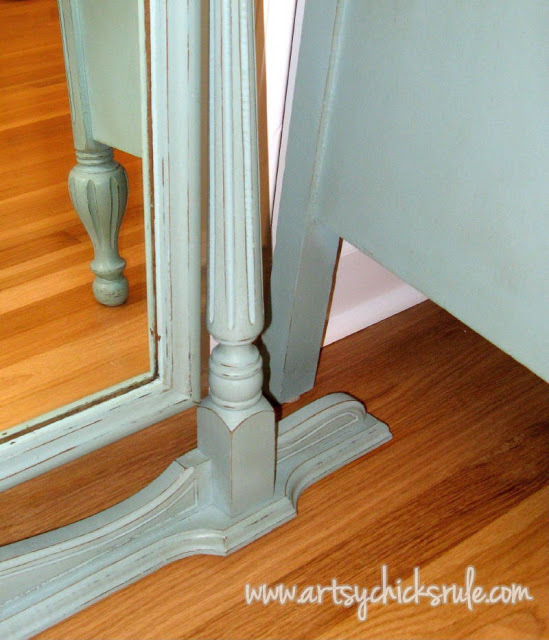 I liked the mirror but my husband thought it looked a little too “dresser-ish” for the dining room. 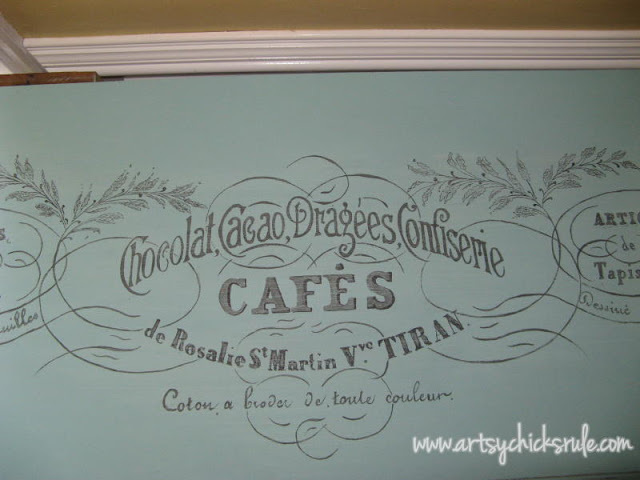 He suggested the chalk board. I love it! I used Graphite for that too. That is not it’s designated use but it does work well as a chalkboard also. Look at the shine on that waxed top. 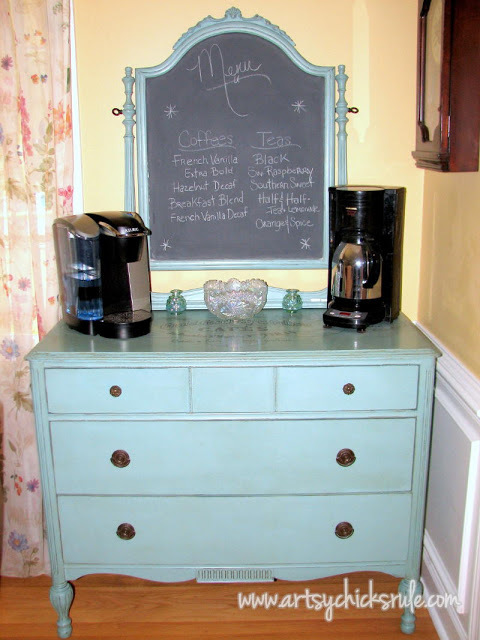 A dresser in my dining room- turned coffee server station. Love it! Want to see how it looks NOW??? 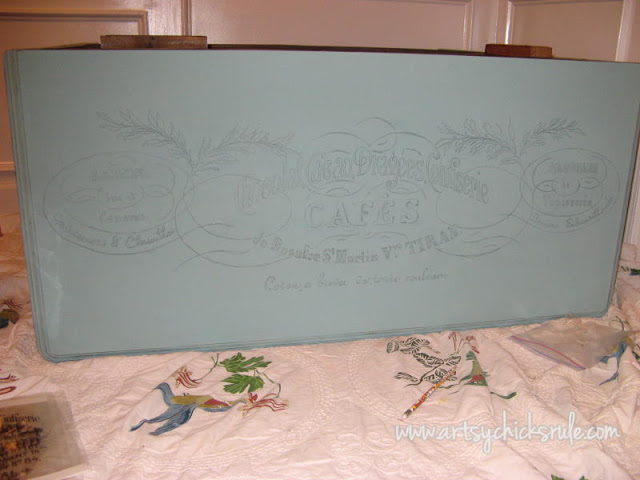 Hop on over and see it here >>> Coffee Server, It Moved and Got New Chalk Art! I love using furniture in new and interesting ways. And not always for their intended purpose. 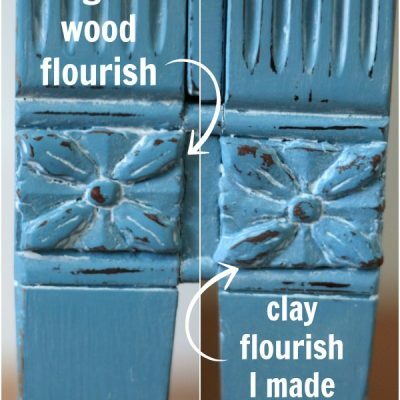 Do you have repurposed furniture in your home too? I’d love to hear about it! 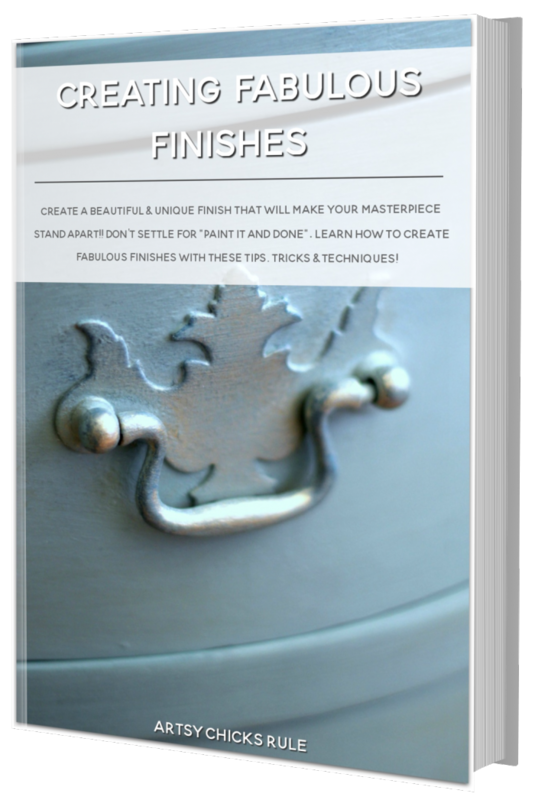 Come see what I make with these next! Beautiful. You did a great job. The mirror really makes it! Visiting from HomeTalk. Wow what a beautiful transformation! I love the color you chose this looks like such an expensive piece of furniture you’d find in a high end catalog! Nancy, this is such a creative idea for a buffet! 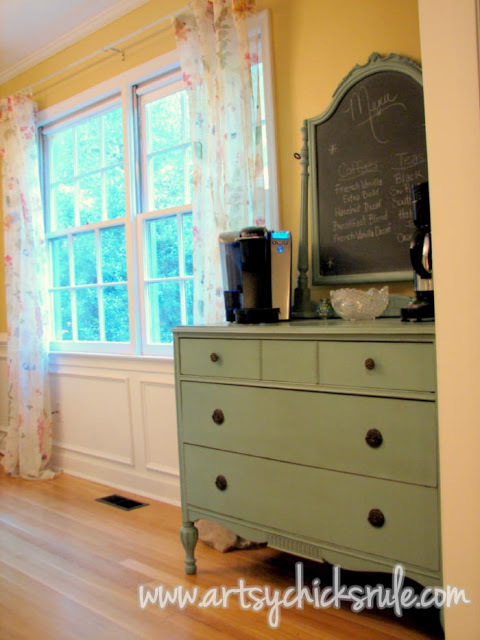 I love that the old mirror becomes a built in chalkboard!!! 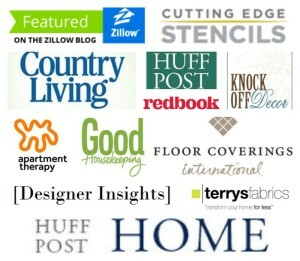 Darling… just like your blog! Thanks Yvonne! Yep, the chalkboard was a great choice and is fun to write different things on when guests are here. 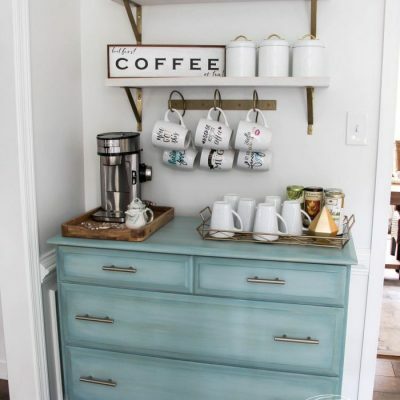 I love coffee stations – and what a great piece of furniture you’ve upgrades with ASCP. Love the colors and the graphics. Great way to have everything you need at hand and out of sight too. Hi Joy! 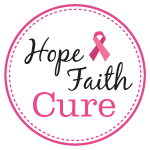 I love ASCP..one of my favorite products. 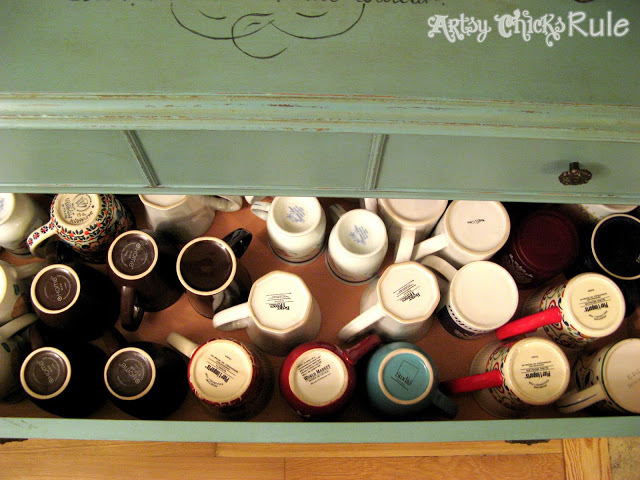 Yes, the drawers work perfectly for mugs and coffee supplies. It’s a great conversation piece! Thanks so much Tanya :) And thanks so much for the pin! 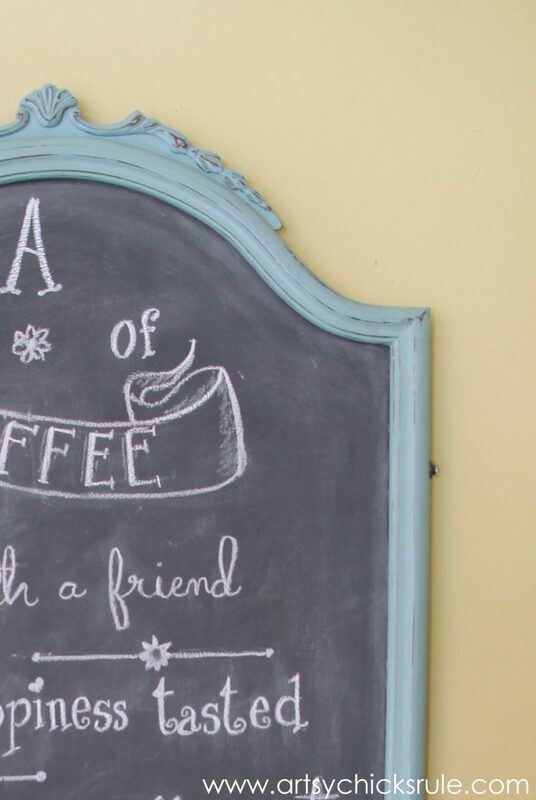 Love this idea, especially the chalkboard. Pretty color too! Thanks Shauna :) One of my fav colors on this one! dropping by from Inspire Me Monday. Thanks for sharing your link! Thanks Rox! 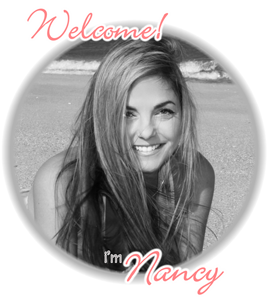 I am so glad I could offer up some inspiration to ya! 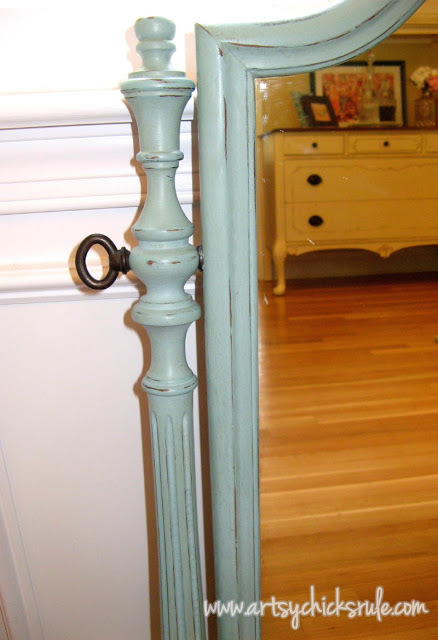 I love repurposing things and using them in an unexpected way. 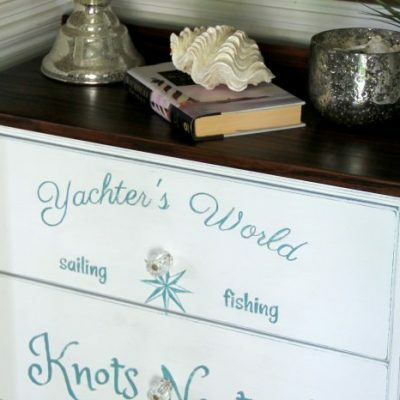 What a beautiful dresser and such a great chalkboard idea! Just lovely! Pinning this one! Oh wow! Thanks so much!!! :) So excited! 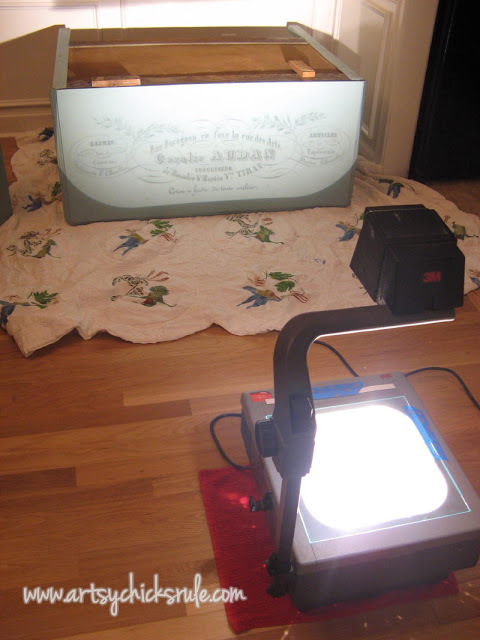 …when you use your “projector” to project an image onto a project….how are you getting to the imagery on your project to do the tracing????. 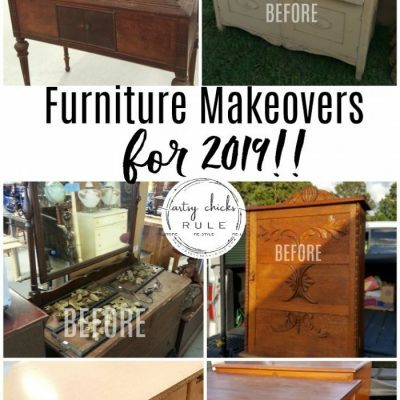 It seems you’d create a shadow and interfere with your tracing….where do you position the furniture or project so you can work in comfort…this confuses me…..thanks for helping me understand how you do that! I love the way this looks. 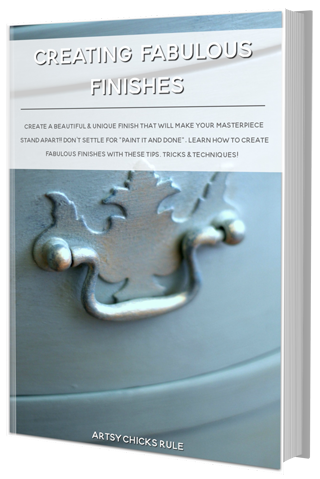 I have a buffet that I want to paint but havent had the courage yet. I do have a question though. 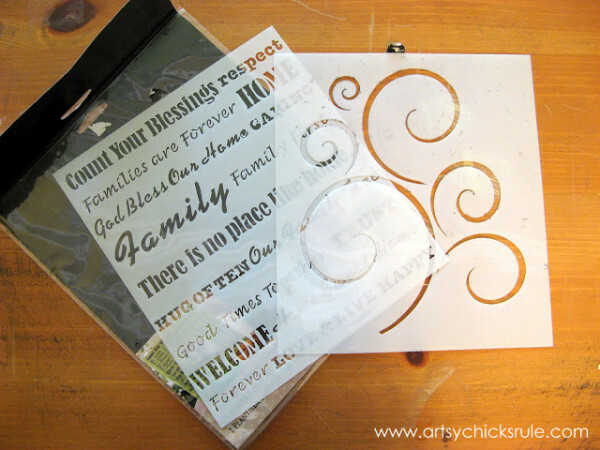 – I have tried using stencils before but the paint always spreads out for like the lettering or shape? How do you get it to look so good?